F for Food: Churning Things Up. My house flooded a couple of weeks ago. There was some damage, but not a ton. Mostly it was a big pain and a big bummer. But, after a week, most of the repairs had been completed by the workmen , the clean-up had been done (by me), and save for the warped hardwood floors and the stench of mildew, all was back to normal. And another week passed. The mildew smell was not getting any better. In fact, it seemed worse. So I looked up mold on the internet. The words fungus and lungs (in the same sentence) popped out at me and I promptly freaked out. I emailed the landlord that he needed to bring over a dehumidifier tout suite and that he, himself, come check out the situation. That didn’t really happen. Then one evening Fred was ribbing me about the lack of photos of us and moreover, the fact that I hate him trying to take my picture all the time, so I ran into my room to grab one of my old photo albums to illustrate the fact that many pictures of me actually exist. And well… the source of the mildew stink was unearthed. My precious photo albums had fallen victim to the flood. And they reeked. I’ve often stated that, if I were only able to save one thing from my burning house (living things aside), that it would be my pictures. Though I’m not entirely certain I still feel that way, this made me quite upset. And so began the process of saving the pictures. It was kind of late at night following a few glasses of wine and Fred helped out. We started with High School. I pulled the pictures out of the album and he laid them out on any flat surfaces he could find in the dining nook. It took about an hour or so and it all looked very strange when we were done. There was High School – a mosaic of snapshots – covering every surface in the room. It appeared very abstract. The next day I was trying to find space in the kitchen to put away the new cast iron items my mom gave me. There is a serious dearth of space in my kitchen. In this process we found my ice cream maker. We decided we should definitely make ice cream. Well, It was mostly Fred’s brain flower. So for the entire day we dug up crazy ingredients around the house and garden and made batch after batch of ice cream! Well, mostly Fred did that. I had to deal with putting High School into a new album and beginning the same process with College. Friends I hardly remember anymore, friends I think about all the time, friends that have died, friends that are still my friends, old loves, old likes, family – alive and dead, me with bad hair, mom with bad hair, dad with the same hair, where I used to live, where I used to play, what I used to do and the people I did it with. All of this thrown up on itself all over the house over an innocent ice-cream-making weekend with Fred. A mixed bag, I tell you. But it was a good thing, really. I edited. Put some of the pictures away elsewhere, reorganized the albums, tightened them up, and all the while I remembered. It was a surprise gift, when I think about it. All of these images, people, places and events are part of the mosaic that is me and my journey. Pretty much exactly like a Chuck Close piece. The boy was busy! And, as it turns out, he is very talented in the ice cream making arena. The mint chip was my favorite as I like the classics. The garden-freshness of the mint added an energizing quality. The blood orange one ended up being very sherbet –like to me, but was my mom’s favorite. The coconut was probably the most interesting and successfully quirky-yet-also-delicious one of the trio. Amelia, from Lindy Grundy, was over the moon for that one. 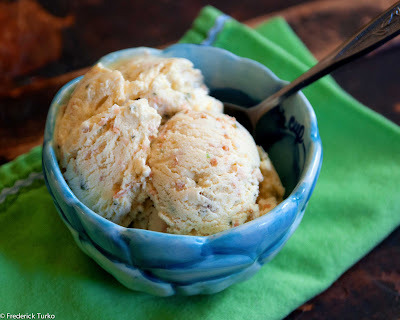 Fred used a standard recipe for the basic ice creams and riffed when it came to the various flavors and textures. 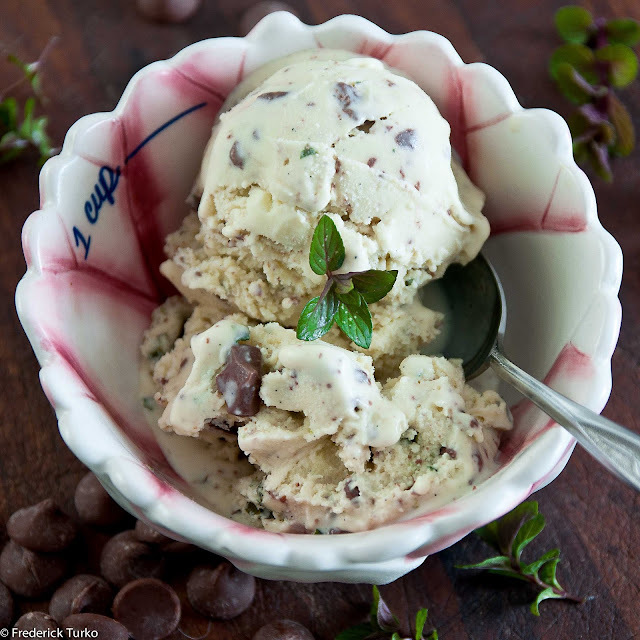 Here I am providing you with David Lebovitz's mint chocolate chip recipe. Why? Because I have the most memories attached to that ice cream flavor. It was one of my favorites as a kid. And still is. I’d even go so far as to bet there is a picture of me eating a scoop of it in one of those photo albums. In a medium saucepan, warm the milk, sugar, 1 cup heavy cream, salt, vanilla and mint. Remove the mint and vanilla bean with a strainer, then press down with a spatula firmly to extract as much mint flavor and color as possible. Once the flavor is squeezed out, discard. Cook the custard, stirring constantly with a heatproof spatula, until the mixture thickens and coats the spatula. If using an instant read thermometer, it should read around 170ºF. When mixture is thoroughly cold, churn using your method of choice. Add chocolate chips to the ice cream when there are about 5 minutes left in the churning process. Transfer to a freezer safer container and freeze for several hours before serving. Well done, I loved it! This is so delicious with fresh mint! i can't believe that all happend! so sorry but happy it resolved well pictures stink and all. coconut thai basil would be my fave i just know it! Angie - I agree, the fresh mit MAKES it! Nastassia - Come over and let's make it together!